INDEPENDENCE, Ohio, November 21 — At Thanksgiving, I ask our membership to join me in a moment of reflection for those who are away from their families at this special time of year. Let us remember our service men and women, who are fighting overseas or are stationed at military bases throughout the world. Let us also remember our own BLET Brothers and Sisters, who are sitting in the cab of a locomotive or in a hotel instead of at the Thanksgiving dinner table with their families. In the toil of our day-to-day lives, we may forget in this season of Thanksgiving that we are truly blessed. We sometimes forget to count our blessings because, as locomotive engineers and trainmen, we work extremely hard to earn our pay and benefits. While our work at the railroad often prevents us from fully enjoying the fruits of our labor, we are blessed with the knowledge that our hard work and dedication puts food on the table and clothes on the backs of our children and families. At this time of year, I would also like to express my thanks to all of our elected officers and staff at the national, general committee, state and local levels. I am thankful for your hard work and devotion to the Brotherhood. Earlier this year, the BLET held its Fourth National Convention in Las Vegas and all BLET members should be proud of the results. Our delegates put in long hours poring over many important changes to strengthen our Bylaws and our Brotherhood. They are part of a long line of delegates who proudly carry the torch of Brotherhood that was first lit by the brave founders who established our great union in 1863. I am thankful for our delegates and am proud of the work they accomplished while in session. But most of all, I am thankful for our members, both past and present. We owe a debt of gratitude to the Brothers and Sisters of past generations, whose commitment and sacrifice helped to lay a solid foundation. And I am also proud of today’s generation of locomotive engineers and trainmen for continuing to build upon that foundation so that today, the BLET stands as the leading rail labor union in America. On behalf of the BLET Advisory Board, I wish you all a Happy Thanksgiving. Since his election Scott Walker has been, by no definition, a friend of the Labor movement. Backed by out-of- state “dark money”, most notably corporate donors such as the billionaire Koch brothers, Governor Walker has rampaged Unions in what was once a proud Labor state. Labor views notwithstanding, Walker has used ”divide and conquer” as a tactic on Wisconsin residents, leaving a once proud tradition of bi-partisanship laid to waste. A world renowned education system is now in tatters, infrastructure is in disrepair and the Governor’s Foxconn debacle will cost generations of Wisconsin taxpayers over four billion dollars. These are just some examples of the effects of Walkers administration has had. Tony Evers strong Labor stance is much needed in this time of a declining middle class in Wisconsin. It is assured that a Governor Evers administration would seek to preserve and protect not only the rights of our Union Sisters and Brothers, but specifically Railroaders, as he has pledged to preserve Wisconsin’s “Two Person Crew” law. The past eight years have proven that Elections have consequences! Use your constitutional right to register and vote. Don’t let your voice be silenced. VOTE this November 6th! The BLET Mobilization Team, in conjunction with the Wisconsin State Legislative Board would like to remind you to take personal action and vote during this mid-term election on November 6th. It is critical that all Members vote to preserve our Union Rights to bargain for wages, health care and safety in the workplace. Additionally, Railroad Retirement, FELA and Whistleblower Protection, amongst others, stand at great risk unless the current administration is not put in check. Registering to vote can be done at your polling place up to and including Election Day, November 6, 2018. Unfortunately, online registration is now closed. Wisconsin does not require a citizen to provide a valid excuse to vote absentee, however; your absentee request must be received by your municipal clerk no later than 5:00 p.m. on November 1, 2018. Voters can also request and vote an absentee ballot in-person in their municipal clerk’s office through November 4, 2018. The link, https://myvote.wi.gov/en-US/VoteAbsentee provides information on requesting an absentee ballot online. Wisconsin also permits no-excuse early voting. This allows citizens to cast ballots in person at a municipal clerk’s office or polling place prior to an election. Use your constitutional right to register and vote. Elections have consequences! Don’t let your voice be silenced. 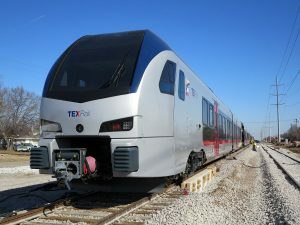 Nearly 80 percent of the members of the International Association of Sheet Metal, Air, Rail and Transportation Workers – Transportation Division (SMART-TD), including its Yardmasters Division, and 88 percent of the Brotherhood of Locomotive Engineers (BLET) members ratified new contract terms with the nation’s largest freight railroads. Four of the six unions in the coalition known as the Coordinated Bargaining Group (CBG) have ratified tentative agreements reached with the railroads in early October. The unions in the CBG represent almost 60 percent of the 145,000 employees covered in this bargaining round. Earlier this week, two other CBG members, the American Train Dispatchers Association (ATDA) and the Brotherhood of Railroad Signalmen (BRS), announced the ratification of their tentative agreements. “The 20,000 UP employees represented by BLET, BRS and SMART-TD will be well served by this voluntary agreement,” said Joe O’Connor, vice president-Labor Relations. In addition to Union Pacific, the NCCC represents more than 30 railroads, including BNSF, CSX Transportation, Kansas City Southern and Norfolk Southern, in national bargaining with 12 rail unions. Bargaining began in 2015. See read the following email. Click on this for full story. The national right-to-work legislation likely would be a major blow to organized labor because it would allow millions of workers to opt out of union membership for the first time. Reps. Joe Wilson of South Carolina and Steve King of Iowa are sponsoring the legislation, which would amend the National Labor Relations Act and the Railway Labor Act to prohibit what unions call “security clauses.” These are provisions that permit union-management contracts that require all employees to join a union or pay one a regular fee as a condition of employment. “At least 80 percent of Americans are opposed to forcing employees to pay dues as a condition of their employment, and our bill would protect workers by eliminating the forced-dues clauses in federal statute. Right-to-work states, like South Carolina, have seen first-hand that job creation and economic growth comes from expanded freedoms. We need to expand common-sense reforms, like those in the National Right to Work Act to protect American workers and create jobs,” Wilson told the Washington Examiner. INDEPENDENCE, Ohio, January 17  The Brotherhood of Locomotive Engineers and Trainmen (BLET) has secured another significant victory for rail workers  this time from the highest court in the United States  in the Unions ongoing campaign to protect two-person train crews. On January 9, the United States Supreme Court denied a petition filed by the Wheeling and Lake Erie (W&LE) asking that the nations highest court review and set aside the 2015 finding by the Sixth Circuit Court of Appeals that the railroads use of managers in place of Union conductors was a major dispute under the Railway Labor Act. In September 2013, BLET National President Dennis R. Pierce authorized a strike by W&LE Conductors over the W&LEs repudiation of Collective Bargaining Agreements that cover the locomotive engineer and trainmen operating crafts. Specifically, the Carrier ignored longstanding crew consist agreements and operated single-person operations, refusing to assign available conductors, in an effort to eliminate Trainmen. When W&LE challenged the strike, a federal district judge issued an injunction on the ground that the dispute was minor and had to be arbitrated. BLET never wavered in its position that the refusal to call Conductors was an outright contract abrogation warranting a strike, and appealed that ruling. In April 2015, a unanimous three-judge panel for the U.S. Court of Appeals for the Sixth Circuit agreed with BLET and reversed the lower court. The panel found that W&LEs claim that the Trainmen Agreement allowed it to man trains without union conductors is frivolous or obviously insubstantial, and the dispute is major. The Court of Appeals vacated the injunction and remanded the case back to the District Court with instructions to dismiss W&LEs complaint. The Carrier then tried unsuccessfully to get the entire Court of Appeals to vacate that decision. Most recently, and in a last ditch effort to gain the right to ignore its agreements with BLET, W&LE petitioned the Supreme Court to take the case. BLET filed a brief in opposition, supporting the decision of the Court of Appeals, and on January 9th, the Supreme Court rejected W&LEs petition. Consequently, the major dispute holding stands, vindicating the Unions position that if W&LE wants to change the rule, it must accomplish the change at the bargaining table, not by unilateral action. I must first thank our members on the W&LE for helping us fight to preserve the Conductors job and for standing strong against the Carriers attempts to implement one-person trains, President Dennis Pierce said. When the decision was made to strike the W&LE, our members were united in their resolve and stood shoulder to shoulder on the picket line, he continued. This final decision by the highest court in the land reminds us all of the importance of strong contract language, followed by strong union activism to protect our contracts. The now unimpeachable decision of the U.S. Court of Appeals for the Sixth Circuit is not only important for our W&LE members, but for all operating employees and rail labor in general. The nationwide fight over operating crew size is far from over, but this victory helps to ensure that union contracts requiring two crew members are enforceable by the union, even to the point of a strike. I also want to thank General Counsel Mike Wolly and his team for preserving this critical court victory on behalf of our members, President Pierce added. From the Officers and Board Members of All Aboard Wisconsin. Moorman Announces Realignment of Amtrak Management Responsibilities, Reporting Chain. Moorman’s letter goes-on to detail the subordinate managers assigned to each of the Business Groups and promises additional information and details on the specific changes and responsibilities of each. In his closing remarks, Moorman specifically calls attention to the priority importance safety improvements and calls for a “continued focus” on that area. Gottleib Resigns, Ross Announced as New WisDOT Secretary. Mark Gottleib, who has served as Secretary of the Wisconsin Department of Transportation since January 2011, has resigned that post effective on January 6, 2017. Gottleib, a Civil Engineer by training, first entered political life as Mayor of his hometown of Port Washington, and later ran-for and served several terms as State Assembly Representative prior to being named Secretary of Transportation by the then-new Walker Administration in January 2011. He inherited his boss’ decision – already announced during the campaign – to turn-back over $800 Million in federal funds for the expansion of passenger rail service from Milwaukee to Madison; but worked quietly, somewhat “under the radar” of publicity, to support passenger rail projects such as the $22 Million renovation of the Milwaukee Intermodal Station’s passenger concourse which opened last summer, the continued operation and proposed expansion of the highly successful Milwaukee – Chicago “Hiawatha” service with station improvements at Milwaukee’s General Mitchell Airport and Sturdevant. Continuing studies for other expansion of passenger rail service, specifically the “TCMC” or “Second Train Study” for additional service between the “Twin Cities-Milwaukee-Chicago”, over the same route as the Empire Builder and service to Superior as part of Minnesota’s proposed “Northern Lights Express” also continued forward during his term in office. In addition, the Secretary conducted a statewide campaign during his tenure to seek public input on the needs and priorities for the State’s transportation system, and made clear that funding to meet those needs whould have to be a priority. Despite recently announced support for transportation funding enhancements by legislative leaders, the Governor has made it clear that he opposes any transportation tax increases without corresponding decreases elsewhere. Gottleib’s future plans have yet to be announced. Current Professional Services Secretary David Ross was announced as the new Transportation Secretary by the Governor’s office concurrent with the announcement of Gottleib’s resignation/retirement. Ross, the former Mayor of the City of Superior, has indicated his support for the Governor’s position on Transportation funding. Announcement of the state’s Transportation Budget proposal for the 2017-2019 biennium is still pending. Kane Retires from AAW Board. Dan Kane, LaCrosse resident and representative of the Amalgamated Transit Union (ATU) State Conference Board, has announced his retirement from the Board of Directors of All Aboard Wisconsin. The action comes concurrently with Kane’s retirement from both his “day job” at the LaCrosse Municipal Transit Utility, and his position as the Chairperson of the ATU State Conference Board, which coordinates operations and policy among all of the ATU Local unions in Wisconsin. Dan’s interest, contributions and wise counsel while a member of the AAW Board has been greatly appreciated. On behalf of the officers and other Board members, we wish him all the best in a well-deserved retirement. Look for AAW Booth at “Mad City Model Railroad Show”. Following a positive experience at Milwaukee “Trainfest” last November, All Aboard Wisconsin will have a booth at the 50th Anniversary “Mad City Model Railroad Show and Sale”, held at the Alliant Energy Center in Madison on February 18-19, 2017. Like the Milwaukee show, the Madison event attracts thousands of members of the public who have some interest in trains; whether they be scale models or “the real thing”. It’s an excellent place to share information about what’s available now for passenger rail service in our region, and our mission to expand passenger rail and connecting public transportation and intercity bus service in Wisconsin. As with the Milwaukee show, we will be looking for volunteers to help staff our booth at the Mad City show. If you can help with set-up on Friday, or help staff the booth on either Saturday or Sunday, please let either Vice President Mark Quam or me know. Watch for additional AAW events this spring, including an appearance at the Titletown Train Show in Green Bay on April 29 and 30. Goyke to Continue as AAW Legislative Director. All Aboard Wisconsin is pleased to announce that Gary Goyke will continue as Legislative Director for the organization for the coming year. While Gary has reduced his consulting practice to spend more time with his family and other pursuits; he has retained several clients, including AAW. We are indeed fortunate to continue to be able to take advantage of his years of experience, great skill, and many contacts on our behalf. Gary will also continue as Corporate Secretary and a member of both the 501(c)3 and 501(c)4 Boards of AAW. Mailing Address Change: Please note that effective immediately All Aboard Wisconsin’s “official” mailing address has changed. Please send all future mailings to 5302 Lighthouse Bay Drive, Madison, WI 53704. Mail already sent to the 754 Williamson Street address will still be collected there until January 31, 2017; so if you recently sent us mail there we’ll still receive it. Have You Renewed?? Thanks so much to everyone who’s renewed their All Aboard Wisconsin memberships for 2017 so far! Oops! What’s that you say – you forgot to renew?? Well, everybody’s busy over the holiday season, so maybe it’s just possible that our appeals last month to renew your All Aboard Wisconsin membership for 2017 got overlooked in the hustle and bustle of the season. Yes, we got a nice “payoff” from the Fall Conference again this year, but “every little bit helps” – and remember your dues not only help us pay our day-to-day operating expenses, they also demonstrate our members’ support to foundations and other donors that we approach for additional funding. So, if you haven’t renewed your membership for 2017 yet – “Why Not Do It Today”?! Just fill out the membership form attached to this e-mail, and pop in your check for the level of membership you desire (please consider becoming a “Sustainer” for just $75), and mail it off to: All Aboard Wisconsin, 5302 Lighthouse Bay Drive, Madison, WI 53704. Recruiting Board Members: With one open board position coming into the end of this year, and the just announced retirement of another Board member, Corporate Secretary Gary Goyke is recruiting for volunteers to serve on All Aboard Wisconsin’s 501(c)(3) Board which manages the day-to-day affairs of the Association. Have questions? Just give Gary a call at (608) 219-5237. Then send him a letter indicating your interest and a brief resume to: All Aboard Wisconsin, 5302 Lighthouse Bay Drive, Madison, WI 53704.